It took 163 games for four of the five National League playoff teams to sort themselves out, as the Milwaukee Brewers and Los Angeles Dodgers captured the Central and West division titles in tiebreaker games on Monday afternoon. That relegated the Chicago Cubs and Colorado Rockies to the wild-card game, with the winner of Tuesday’s tilt at Wrigley Field making the short trip north to Wisconsin for the division series, while the Dodgers square off against Atlanta. Whoever comes out of the National League playoffs figures to be an underdog in World Series betting, given the powerhouses in the American League. But who’s it going to be? More importantly, where’s the value for MLB betting fans? How often can you get a line like this on a team that was tied for the best record in the league? The Cubs did blow a five-game lead in the Central in September, and did lose on Monday, but send old reliable Jon Lester to the mound for the wild-card game against a Rockies team flying halfway across the country after a dispiriting loss in Los Angeles in their own tiebreaker. Every bat in the lineup is dangerous, with Javier Báez stepping up as an MVP candidate this year to join Ben Zobrist, Anthony Rizzo, and Kris Bryant in a particularly burdensome heart of the order. Pedro Strop, out for the second half of September with a hamstring injury, is ready to rejoin a bullpen that is exponentially more effective with him in it. Tyler Chatwood will be nowhere near a mound. The reasons not to like the Cubs’ chances are generally sluggish play down the stretch and the fact that anything can happen in the one winner-take-all game that starts their postseason journey. But again, this is a moment when you can get a hypertalented team at +500 – it’s hard to pass that up. Bet the Cubs at +500 with 888Sport. Last year’s pennant winners got off to a slow start and spent only 42 days all season in first place during a dramatic three-way race with Colorado and Arizona. But the Dodgers were atop the division on the one day that counted, the last day. 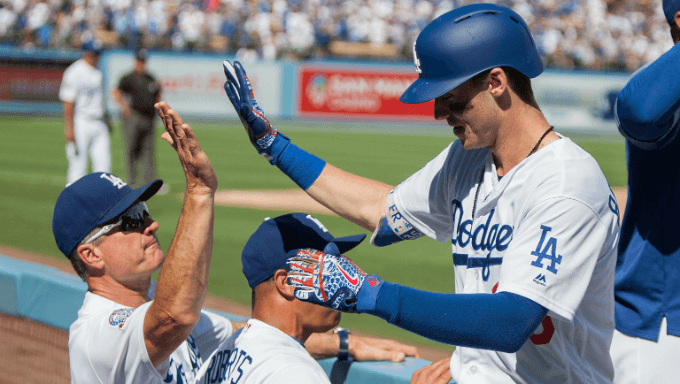 The reason that the Dodgers are the favorites should be pretty clear – they scored the most runs in the National League this season and allowed the fewest. The latter is to be somewhat expected for a talented pitching staff that calls Dodger Stadium home, but consider that Clayton Kershaw isn’t even Los Angeles’ best pitcher right now. That would be Walker Buehler, who dominated the West tiebreaker. Oh, and Hyun-Jin Ryu has a 1.88 ERA with 53 strikeouts and six homers allowed in nine starts since rejoining the rotation in August. The bullpen is a worry, including the fact that Kenley Jansen has been vulnerable to the longball. Take the Cubs at +175 with 888Sport. The team with home-field advantage throughout the National League playoffs was 51-30 at home this season, and their odds will get shorter if the Rockies pull off the upset in the wild-card game. The concern for the Brewers is facing the Cubs, who won 11 of their 20 matchups this year and can turn Miller Park into Wrigley North. That said, Christian Yelich nearly won the Triple Crown leading a strong lineup that has good bench options, and the Brewers’ bullpen strikes out everyone in sight. Can a rotation featuring Wade Miley and Gio Gonzalez really get Milwaukee to the World Series? Both have been great for the Brewers, but there’s definitely some waiting for the other shoe to drop that makes it tough to pull the trigger at +200 with 888Sport. Burning through German Marquez in the West tiebreaker and Kyle Freeland in the wild-card game means that if the Rockies advance to the main draw, they don’t get to use one of their top pitchers until Game 3 of the division series, by which point it might not be salvageable. You can’t count out the Rockies because of Nolan Arenado, Trevor Story, Charlie Blackmon and David Dahl, plus a bullpen that stacks up with Milwaukee as the best in the Senior Circuit. But it would be a big ask to get past the Brewers with the rotation in the shape it would be in and a lineup whose weakness beyond its stars can be exploited by teams as good as the ones in this field. You can bet them at +650 with 888Sport. The team with the worst record of any of the 10 playoff teams glided into the postseason by virtue of the Nationals stinking up the joint for five months and the Phillies going 8-20 in September. Seriously, Atlanta went 16-12 in the final month, the same record that the Cubs had in choking away a division title they’d seemed to have locked up. With Ronald Acuña and Ozzie Albies at the core, Atlanta is set up to contend for years to come. The rotation and bullpen are good enough to get the job done, and power is well enough distributed through the lineup to make Atlanta capable of scoring with one swing of the bat at any time. But when you get to this price point, things like “12-24 record against this year’s postseason teams” jump out. If you’re getting in on a team at +500 as the playoffs begin, make it the Cubs instead.